Many years ago, I took a passenger barge up the mighty Congo River. What an adventure! What stories I would tell! About freedom! But it didn’t happen. I never managed to say much more than that the forests were vast and the river as broad as Kalmar Sound. And that I’d been there. So it goes when you travel for the sake of something to say. Your eyes go weak. All I could have written were endless disquisitions about homesickness. So I kept my mouth shut. I was in the process of rigging up my big California fly trap between a couple of over-blooming sallow bushes down by the creek – a complicated manoeuvre – when a complete stranger appeared as if from nowhere. He just stepped straight out of the lush June greenery and addressed me politely and apologetically in English. A wood warbler sang its silver song somewhere in the trembling crown of a nervous aspen, and a pike splashed in the shallow water of the creek. The mosquitoes were stubborn in the shade. He said it was me he was looking for. ‘I’m looking for you,’ were his exact words. This man was in fact, and still is, the only person I’ve ever encountered by Ladäng Creek. If you want to be left in peace, it’s a good place to go. Islanders never go there, and the summer people don’t know the place exists. The paths that once led there have now vanished. The name of the creek is not even on the map. For that matter, it’s not much of a waterway, more of a ditch – overgrown, silted up and periodically dry. The meadow barns that are said to have stood there are long gone, as indeed are the meadows. Slowly but surely they’ve been invaded by fir, aspen, birch and alder. All the same, it’s a very pretty place, as rich and spacious as a cathedral when the marsh marigolds bloom in the spring. Deer meet down by the creek, sometimes moose, but never people. Except that day. In the Middle Ages, Ladäng Creek was the channel boats used to sail to a village at the far end of the bay which rising land elevations eventually turned into a fresh-water lake. The village is still there. It’s where we live. How old it is no one knows, but there were probably people living here as early as Viking times. The inner parts of the long bay, where the humus-brown water is very deep, must have made an ideal harbour – a sanctuary that seafarers with base intentions surely hesitated to venture into. The granite cliff drops straight into the water. The village was easily defended against attackers from the open ocean to the east. Who had told him I would be right here? How very strange. Why hadn’t he called first, as other people do, or at least sent a letter or an email saying he wanted to arrange a meeting? A fly person, of course. News travels fast and globally in our line of work. Criorhina ranunculi has not yet been observed in England, and Blera fallax is a rarity, a fabulous creature that collectors there can only dream about. Here it is not uncommon. There is no shortage of reasons. It struck me that maybe it was my seven specimens of Doros profuges that explained my standing here eye to eye with a fully equipped Englishman, complete with an oilskin coat of that indeterminate colour favoured by military quartermasters. Middle-aged, balding, foolishly bare-headed, waving his arms like a semaphore. As mentioned earlier, the mosquitoes were annoying. But in that case, I thought, he’s come way too early. Doros doesn’t appear until the first week in July. If we’re lucky, that is. Sometimes it never appears at all. The Englishman then initiated a conversation that gradually dispelled my questions – and left me embarrassed at my own presumption. But to start with, the whole thing grew even stranger. He stepped towards me across the mud with a book in his hand that quickly revealed itself to be a well-thumbed copy of Stockholmstraktens Växter, a guide to the plant life of the Stockholm region, published in 1912. As if it were a perfectly natural continuation of his puzzling opening remark, he approached me eagerly with the book opened to a page showing local trees. And it was only then that I realised it wasn’t me he was looking for, and that what he had said was ‘I’m looking for yew’, a tree that, according to his guidebook, grew ‘abundantly’ on this island. I’ve run into any number of strange botanists over the years. It’s usually orchids they’re searching for — lady’s slippers, red helleborine, marsh helleborine. And they get lost. Especially if what they’re looking for is white adder’s mouth, not to mention the musk orchid, which no one has seen on the island since 1910, when Sten Selander, a botanist and member of the Swedish Academy, found a single specimen. I have answered their questions, sometimes a little evasively in order to save the orchids from getting trampled to extinction, but this one was new. So when I had told the man where the island’s yews might be found, I ventured to ask how it was that his curiosity had taken such an unexpected turn this lovely summer day. ‘Well, you see,’ he said, and went on to explain quite openly that he was freelancing for a French pharmaceutical company that had assigned him to investigate this and other areas of northern Europe for the possibility of harvesting taxol, a substance found in the inner bark of the yew, which has shown itself to be an amazingly effective agent against various forms of cancer. I knew quite a bit about taxol from a book I had translated — enough to have quite a satisfactory conversation about it. Moreover, I could tell him with great certainty that the yews here on the island were too few and too frail to be of use. He was looking for large stands. There were none here. The Baltic States might be worth a look, I suggested. (It was just a guess, plucked from thin air.) The man listened attentively as he waved his arms. Yes, he was on his way in that direction. By way of Gotland, if I understood him correctly. Then we talked for a bit about ferries and about the weather before he thanked me for my help and walked on, to the south-east, towards the limestone outcroppings by the mouth of the creek. An odd man. And the last thing he said was as remarkable as the first. Say what you like about Englishmen, but they are often cultured people. In the course of our brief conversation, we had not touched upon what I was doing there in the undergrowth by the creek. We had not said a word about insects. Of course he had noticed my hand net, but unlike all my fellow Swedes, he had clearly seen it as no more than a perfectly natural part of what a gentleman is expected to carry with him when wandering field and forest. He had not felt the need to ask questions. How pleasant! His comment about the trap was merely an acknowledgement. He did not ask what it was, not even if it was a Malaise trap. Simply observed in passing that it was large. That was the last thing he said. And I stood there in the sedge, as noted earlier, quite speechless. Extracted from The Fly Trap by Fredrik Sjöberg (Penguin). © Frederik Sjöberg, 2014. 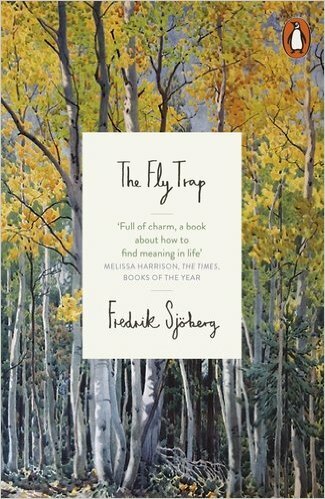 In addition to being an entomologist, Sjöberg is a literary critic, a cultural columnist and the author of several books, including The Art of Flight and The Raisin King, which form a trilogy with The Fly Trap.